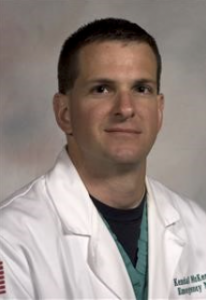 Dr. McKenzie is a professor in emergency medicine at the University of Mississippi Medical Center. He received his medical degree from Universidad Central del Caribe School of Medicine, and completed his emergency medicine residency and a transitional internship in emergency medicine/anesthesiology at UMMC. He is the chair of the Emergency Medicine Quality Council and has a focus in training others in emerging infectious diseases, disaster management, and critical care medicine for paramedics. He is active in the U.S. military and the Mississippi National Guard for which he has been deployed for several operations. Dr. McKenzie’s clinical and research areas of interest include emergency medicine, disaster medicine, flight medicine, and wilderness medicine.